opt = pidtuneOptions returns the default option set for the pidtune command. opt = pidtuneOptions(Name,Value) creates an option set with the options specified by one or more Name,Value pair arguments. Target phase margin in degrees. pidtune attempts to design a controller such that the phase margin is at least the value specified for PhaseMargin. The selected crossover frequency could restrict the achievable phase margin. Typically, higher phase margin improves stability and overshoot, but limits bandwidth and response speed. Closed-loop performance objective to favor in the design. 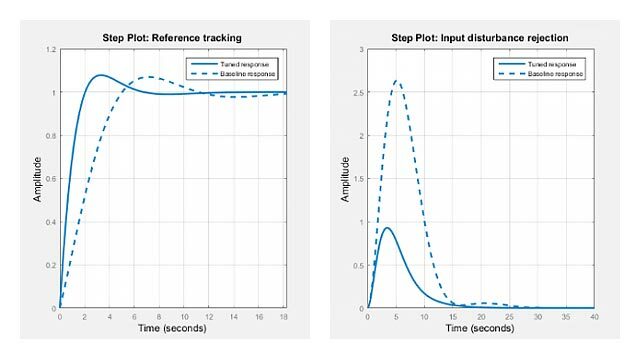 For a given target phase margin, pidtune chooses a controller design that balances the two measures of performance, reference tracking and disturbance rejection. When you change the DesignFocus option, the tuning algorithm attempts to adjust the PID gains to favor either reference tracking or disturbance rejection while achieving the same target phase margin. In the control architecture assumed by pidtune, shown in the following diagram, reference tracking is the response at y to signals at r, and disturbance rejection is the suppression at y of signals at d.
'balanced' (default) — For a given robustness, tune the controller to balance reference tracking and disturbance rejection. 'reference-tracking' — Tune the controller to favor reference tracking, if possible. 'disturbance-rejection' — Tune the controller to favor disturbance rejection, if possible. The more tunable parameters there are in the system, the more likely it is that the PID algorithm can achieve the desired design focus without sacrificing robustness. For example, setting the design focus is more likely to be effective for PID controllers than for P or PI controllers. In all cases, how much you can fine-tune the performance of the system depends strongly on the properties of your plant. For an example illustrating the effect of this option, see Tune PID Controller to Favor Reference Tracking or Disturbance Rejection (Command Line). A pure integrator in the plant (s = 0) or (|z| > 1) does not count as an unstable pole for NumUnstablePoles. If your plant is a frd model of a plant with a pure integrator, for best results, ensure that your frequency response data covers a low enough frequency to capture the integrator slope. Object containing the specified options for pidtune. Tune a PIDF controller with a target phase margin of 45 degrees, favoring the disturbance-rejection measure of performance. then use pidtuneOptions to specify the number of unstable poles in the plant.